We all get the afternoon slump. Around 2:00 pm we start to feel drowsy, sleepy and just plain spent. Reaching for a cup of joe seems reasonable or downing a cookie might pick up our blood sugar but what if today we made something different. A cup of golden milk. It's full of spices that might give us the kick we need to keep us alert, awake and energized. 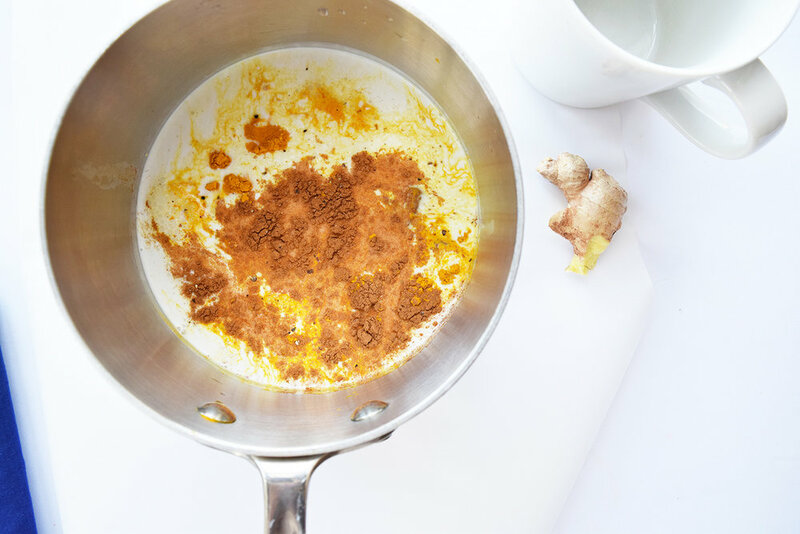 Step 1: In a small to medium saucepan add the coconut milk, water, turmeric, cinnamon, ginger and black pepper. Wisk to combine. Step 2: Place the pan on the stove top and turn the heat to medium. Once the liquid boils, remove from heat add the maple syrup. Let cool for 10 min. Step 3: Divide the milk into two mugs and top with coconut whip cream and a dash of turmeric. May your afternoon be golden and your day great. Jan 30 Here Is One Dinner That Will Make You Less Of A Chicken.